Homeless people share their life stories: Rebecca, Andrew, Elle, Melissa and sk8r rat. Rebeccas Community was founded in 2002 by two friends Dominic Mapstone and Gerry Denton. As a Social Worker, Dominic was coordinating a service for homeless people in Brisbane. Gerry, a computer programmer by day was volunteering with the service. The friends often debated at length how to improve the service and what further services were needed for homeless people. The focus of their debate often revolved around a group of homeless people who were first homeless at a very young age (6 to 12 years old) and had lived for some years on the street, often including some time in juvenile detention and prison. By the time members of this group reached 21, they were often in prison serving longer sentences or dead. 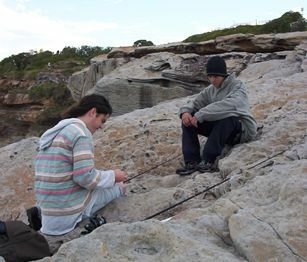 Dominic and Mouse fishing off the cliffs for dinner. The remainder were living on the streets heavily involved in drug abuse and very few of them had any real prospects of moving off the streets. The most chronic of homeless, their needs were so significant no one service was positioned to provide the ongoing intensive support and understanding they needed. For six months we researched existing support services: for homeless people; for people in the juvenile justice system; drug and alcohol rehabilitation programs, and mental health support services. This research took us to Sydney for a number of weeks where we talked at length with homeless people and some of the local service providers. Towards the end of 2002 we decided to move to Sydney and establish a new service for homeless people as the city had the largest homeless population in the country (the greatest need). At the end of 2003 we stayed with friends in the Josephite Community Aid house at Lidcombe, for a few months break to recharge for the new-year. In 2004 we moved our operations to Lidcombe establishing 'Hospitality House,' where we continued to invite homeless people to live with us. In 2006 we moved Hospitality House a few suburbs north to a larger house with more rooms and living space in the suburb of Carlingford. In 2010 we moved our base of opperation to Brisbane, Queensland and extended our international support services for homeless people beyond the funding and project management of the online International Homeless Forums, to Dominic's founding and launch of World Homeless Day (an annual event, marked on the 10th of October around the world). Today Rebeccas Community has clients in all states and teritories of Australia, receiving ongoing direct support. Our preference remains with homeless people who were first homeless when they were very young and can't at this point in their life be assisted by a mainstream old fashioned service for homeless people, because of their exceptional needs. It is also the most significant force internationally providing suport to homeless people in more countries around the world (via the Homeless Forums) than any other NGO, and provides a vehicle for the homeless sector the world over (via World Homeless Day) 'to further the interests of homeless people locally'. Rebeccas Community also funds a peer-education project locally in Australia promoting safety during Schoolies Week. In 2010, Rebeccas Community and Hospitality House moved beyond a residential program to focus on the support of all homeless people in Australia who were first homeless when they were very young and are now at a stage that they want to exit homelessness but can not do so via the traditional routes due to their more complicated needs. As a service provider that has a very significant presence online (often toping search results), and one that is available often times outside 'business hours' of many charities .... we respond to emergency calls from any homeless person in Australia that can't effectively access the support they need in their local area. While we have our area of specialisation, any homeless person asking for assisstance is helped to access the most apropriate service in their geographic area within Australia and to gain the best result possible. This is a crutial service because the greatest frustration people face when they are homeless is the run around from one service to another that can last days or even weeks before they get in touch with the service that is designed to adress their needs, or has the ethic to streatch their design like elastic to help them out. Inappropriate referrals to another homeless service are more common than an accurate referral to a service that can help. Even when they get pointed towards the right service with the right resources to help them, homeless people often need an advocate that will be taken seriously or viewed as on an equal par with them in terms od social power (or exceed them). Rebeccas Community has the freedom to care personally for each person facing or experiencing homelessness and respond to their individual needs because we aren't locked into a set of criteria by a government funding body such as the age or gender or circumstances of people that can be helped / and discard all others that don't fit the funding)..
Our philosipy of 'the home base you can always return to' is pervasive in our work. Beyond the crisis at hand, our priority is to establish relationships so we remain available to people at any stage in their journey as a home base to turn to. Just like a family should work. Some of our clients ask for help several years after first having contact with Dominic on the streets. A request such as "I need to come home," is never turned down.